Scholastica | What does the manuscript status mean? The status of a manuscript helps editors quickly understand what work has been done reviewing the article. 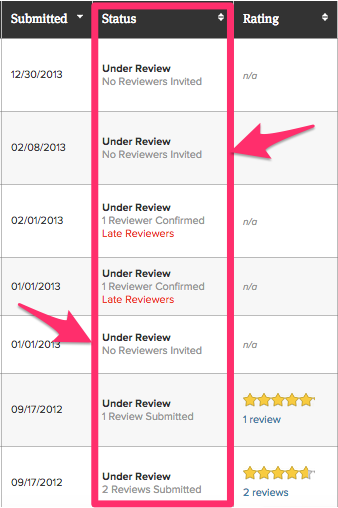 No Reviewers Invited - An article has been submitted, but no reviewers have been invited. Reviewers Invited - At least one reviewer has been invited to review the manuscript. Reviewers Confirmed - At least one reviewer has accepted an offer to review the manuscript. (Number) Reviews Submitted - A total of (number) reviews have been submitted for this manuscript. Withdrawn - The manuscript has been withdrawn from the journal. Rejected - The journal made a decision of Reject for the manuscript. Desk Rejected - The journal made a decision of Reject for a manuscript and no one completed the reviewer form. Revise and Resubmit -The journal made a decision of Revise and Resubmit for the manuscript. Publication Offer Declined - Only for journals configured to allow publication offers, this means the article was given a decision of Accept but that the author declined the publication offer. Ready to Publish - This manuscript is ready to be published and needs no further work. Pending Publication Offer- Only for journals configured to allow publication offers, this means the article was given a decision of Accept but that the author has not yet accepted or declined the publication offer.